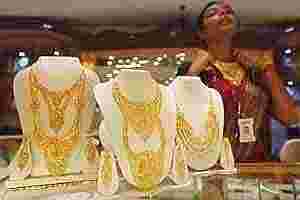 Mumbai: Gold prices in India, the world’s top buyer, eased tailing soft overseas prices, but not enough to attract buyers in a traditionally lean demand period, dealers said. The most-active February gold contract on the Multi Commodity Exchange was 0.13% lower at ₹ 27,774 per 10 grams by 3:36pm. International spot gold prices inched down in thin trade on Thursday as investors remained sceptical of the euro zone’s ability to tackle its debt crisis after the European Central Bank’s latest moves to keep credit flowing in the region. The rupee plays an important role in determining the landed cost of the dollar-quoted yellow metal. The Indian rupee fell on Thursday as doubts about solving the euro zone debt crisis heightened the prospect of foreign funds outflows from riskier assets.